Each year, tens of thousands of small businesses cope with damage from fires. Sadly, a number of these companies never re-open. That’s why taking steps to reduce the risk of fire at your business is such a smart thing to do. But it also can save you money. Install and maintain fire safety equipment. Many small business owners and managers are too busy to think much about fire prevention. At a minimum, you’ll want smoke alarms with batteries that are changed twice yearly. You’ll also want fire extinguishers on hand. (Make sure you and your employees know how to use them.) Your insurance agent can help you determine whether additional fire-prevention measures, such as sprinklers, are needed or if optional upgrades that can earn you a discount on your policy are worth the upfront investment. Store chemicals carefully. Make sure you’re storing all chemicals, including the flammable variety, carefully. Did you know that gas cans can explode in certain situations? De-clutter. Dispose of boxes and trash promptly. A pile of boxes can provide the fuel for a fast-moving fire. Remove clutter from hallways and exits. Have an electrician review your wiring. If you have purchased or are leasing an older building, it may be wise to have an electrician inspect it for any faulty wiring or other potential fire hazards. While having fire drills may be the last thing on your mind, they can help increase the likelihood that everyone makes it outside your building safely in the event of a fire. 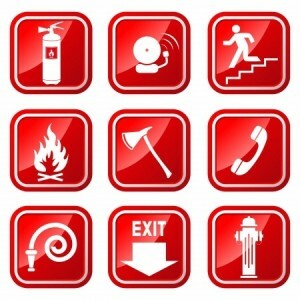 Do your employees know what they should do if there’s a fire? Which exit should they use? Periodic reminders can help make sure everyone knows what to do – and that they get out safely – in the event of a fire. Ask questions. We can help identify a number of risks your business can face each day and make sure you’re adequately insured. Have any questions? We would be glad to answer them!